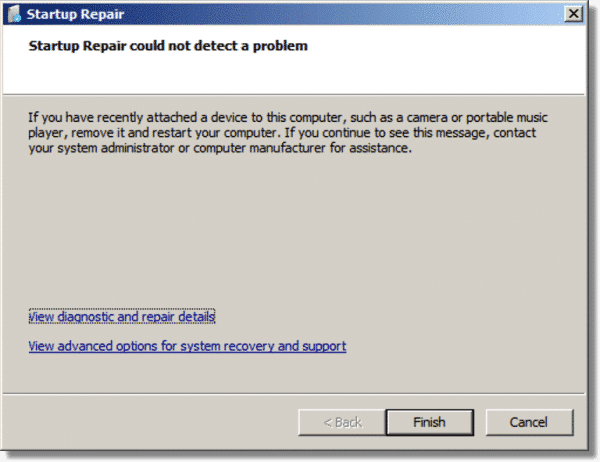 Fixing Windows 7 Boot Problems - Ask Leo! Every once in a while, things become corrupted on your hard disk in such a way that Windows 7 is unable to boot. From the MBR (Master Boot Record) to other information critical at boot time, if it’s not there, you can’t boot. Step one is simple: boot from the Windows installation or setup disc. You might not have a setup disc. You must be able to configure your BIOS or UEFI to boot from something other than the hard drive. You may not have an optical (CD/DVD/BluRay) drive, in which case you’ll need to boot from a USB image of the setup disc. The first can be dealt with either by contacting your computer’s manufacturer for a disc, or by downloading an image of the Windows setup disc and burning it to an actual disc. The answer to the second depends on the machine you have, so all I can advise is that you contact your computer’s manufacturer for instructions. As for booting from a USB device, there are two options. First, there are techniques (which I hope to cover in a future article) to create a bootable USB flash drive of your Windows setup disc. Honestly, I much prefer a simpler approach: get a USB DVD drive. Configure your computer to boot from USB, and in most cases, you’ll be able to boot from a disc inserted into the USB optical drive. The first step when you boot from the setup disk is to choose your language and keyboard layout. These are only conveniences for this troubleshooting session; we’re not going to “install” anything. Click Next after you’ve made your selection. Windows Setup will present you with a nice big Install Now button. Don’t click it! We’re not installing, we’re repairing. Click the Repair your computer link at the lower left. Windows Setup will then search for Windows installations on your hard disk. It’s likely that you’ll have only one, so you can simply click on Next. The next dialog lists the various options and tools we have at our disposal. 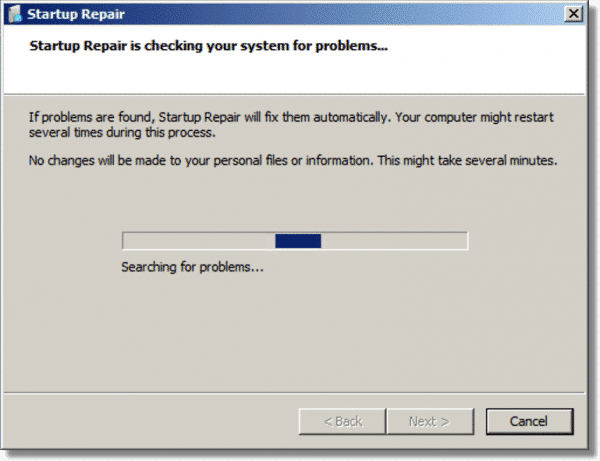 I strongly recommend Startup Repair as the first tool to run whenever you’re experiencing boot problems. The utility will examine your system for common problems and fix them if it can. Much of the time, this is all you need do. We’ll try other tools next. 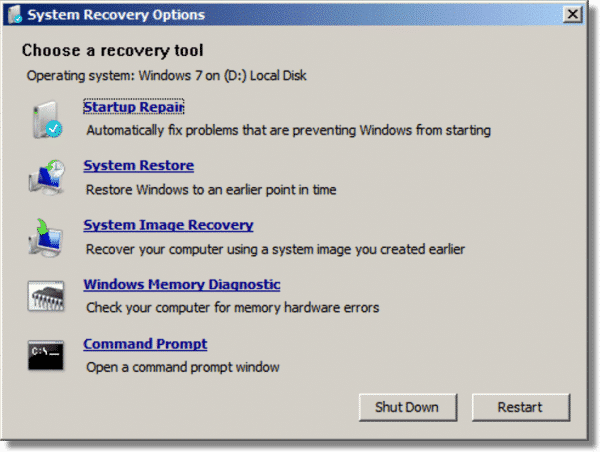 Click on View advanced options for system recovery and support, which will return us to the menu of available tools. Click on Command Prompt in that menu of tools. In Command Prompt, type “bootrec” followed by Enter. This tool is designed to repair the boot record. It’s possible — even likely — that it’s redundant to Startup Repair above, but it may also give us additional information should things fail. I recommend giving it a try, since it’s unlikely to harm anything. These are single-purpose tools that fix — actually, reset — exactly what they say: the master boot record (MBR) and the boot sector. 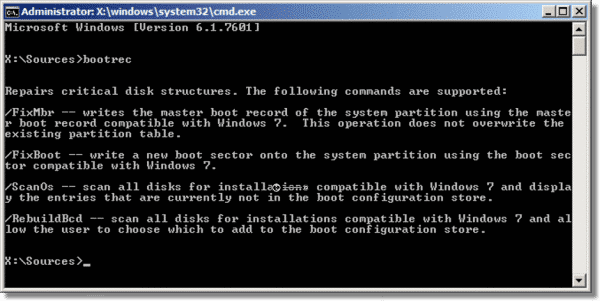 “BCD”, or Boot Configuration Data, indicates which Windows installations on the machine are to be considered at boot time. This is a more complex tool, and most of the time it will succeed, reporting no Windows installations were found. 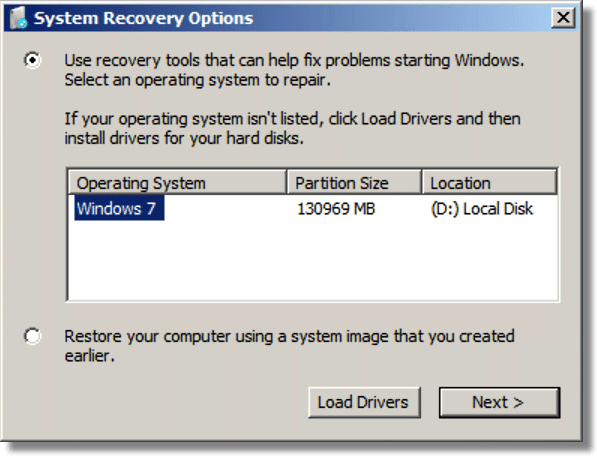 The theory2 is that it’s simply reporting no additional Windows installations were available to be added to the list. There are techniques to rebuild the BCD as a more advanced troubleshooting technique, but they’re beyond the scope of this article (particularly with likelihood that the Startup Repair tool will have covered this as well). After running those utilities, eject your installation media and reboot your computer. Note: A Windows 10 version of this article is in the works. Did My Boot Defragmenter Tool Actually Fix My Boot Problems? – A bad sector on your hard drive could be causing strange intermittent problems. I’ll show you an easy way to find out. Turn Off Fast Startup in Windows 10 – Fast startup optimizes boot-time speed, and is an occasional suspect in boot-time problems. Turn fast startup off to get clues. What Do I Do If I Can’t Boot from a CD or DVD Drive? – Many computers are now built without DVD drives. This can cause big problems when you need to restore your computer. How to Rebuild the BCD in Windows – the “more advanced” technique referred to above, via Lifewire.com. 1: The case in my example. 2: I’ve seen no official confirmation. « Previous post: BitTorrent: You need to understand why last week’s bootlegged theatrical movie release probably is illegal! I was very “Happily Surprised to see an article about Windows 7. Being a “7” user, I notice when this happens. It seems like all I see is Windows 10 “stuff”. I understand, but realize that I do have to prioritize that which most people are using in order to help the most people I can. In the last week over 1/3rd of the site visitors were running Windows 10 – by far the highest percentage. 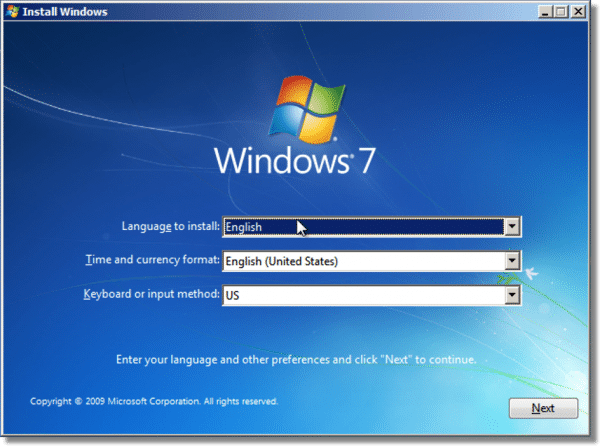 Windows 7 comes in second at 17%. The Windows 10 number will only get larger over time. 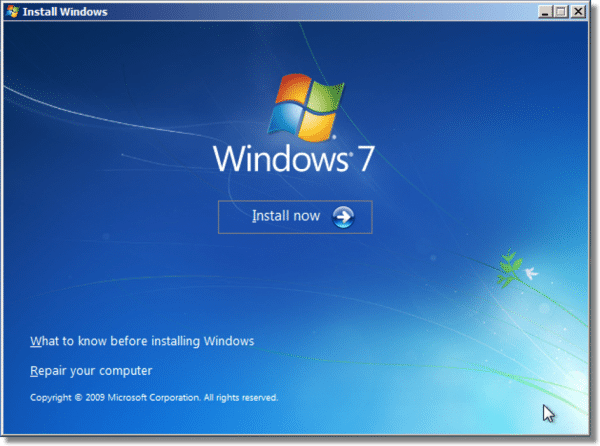 Windows 7 will only get smaller. It’s big enough now that I try to reference it as appropriate, but you can expect the number to go down (and not just here, but across the internet 🙂 ). FWIW: MANY (perhaps most) of my articles are completely Windows version independent. So don’t assume something doesn’t apply because you don’t see Windows 7 mentioned. I’ve done this a few times in XP, fewer times with Windows 7 and never needed to do that kind of recovery in Windows 10. To me it’s an indication that each successive version of Windows is more stable than the previous one. “So don’t assume something doesn’t apply because you don’t see Windows 7 mentioned”. I’m hoping this is applicable to Vista. After replacing the screen and reinstalling Vista, it worked. It sat unused for a year and now won’t boot up. Wish me luck. It may not be exactly the same in Vista but it’s similar in all versions of Windows since XP. I’ve done this a few times in XP. continuation process of learning from these news letters. Thanks.